Ponte Vedra Wellness Center was founded in 2004 by Dr. Erika Hamer on the principle of improving every patient’s overall health and wellness. Unlike traditional medicine, which often only seeks to resolve symptoms, drug-free holistic care at Ponte Vedra Wellness Center aims to address the underlying causes of body dysfunction. Our founder, Dr. Erika Hamer, is a graduate of Chiropractic School at Life University in Marietta, GA. Additionally, Dr. Hamer holds a post-graduate designation of Diplomate in Chiropractic Neurology, is licensed in Neuro-Electrodiagnostics, certified in Webster technique for pregnancy chiropractic, holds AFAA certification as a fitness trainer, and is currently pursuing certification in chiropractic pediatrics. A graduate of Palmer College of Chiropractic in Port Orange, FL, Dr. Casey Means brings years of experience as a family chiropractor. He’s treated a wide range of conditions in patients of all ages. Dr. Means comes from a family of chiropractors and has experienced first hand the benefits of chiropractic care. Chiropractic care is more than just back cracking. At Ponte Vedra Wellness Centers, we offer various treatment techniques that work with chiropractic care to help the body heal itself. In addition to the listed services, we offer total health and wellness services including personal training, corrective exercises, and nutritional counseling. Contact our Chiropractor in Ponte Vedra Beach and Nocatee Today! With two convenient wellness center locations, our team of health experts is always close by to provide the care and treatment you’ve been searching for. To contact our Ponte Vedra location, call us at (904) 273-2691. 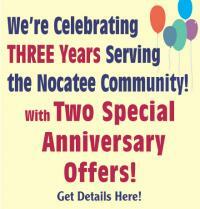 To contact our Nocatee location, call us at (904) 483-2717. Our experienced chiropractors, Dr. Hamer, and Dr. Means look forward to guiding you on a path of improved health and wellness. Take advantage of this month's "Condition of the Week" Special Offers!